Both bands, who are much-loved by Australian and New Zealand fans, will play indoor concerts at Melbourne’s Margaret Court Arena, Sydney’s Hordern Pavilion, Auckland’s Vector Arena and Christchurch’s Horncastle Arena as well as roaming Australia on a day on the green winery show dates nationally. Australia was the first country in the world to embrace Simple Minds, giving the band its first ever hit single ‘Love Song’ and first Gold album New Gold Dream (81-82-83-84). The love affair has continued ever since through countless chart-toppers like ‘Don’t You (Forget About Me)’, ‘Alive and Kicking’, ‘Promised You A Miracle’, ‘Glittering Prize’ and ‘Waterfront’ spanning eight Top 20 albums and hugely successful concert tours. 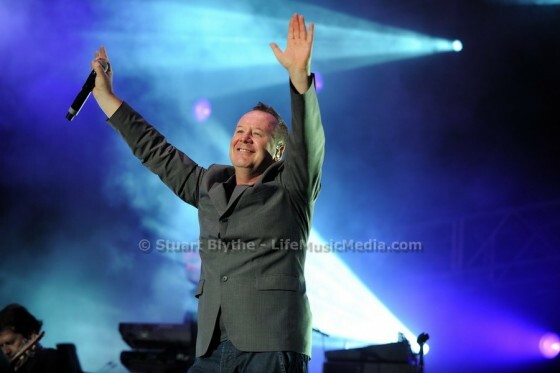 After touring Big Music extensively, and buoyed by the record’s success, Simple Minds are currently working on a new album. They will be back on the road in 2017 with Australia one of their first ports of call, having not toured here in four years. Throughout their lengthy career, the band has retained its enviable reputation as one of THE great live concert bands. When The B-52s – Fred Schneider, Cindy Wilson, Kate Pierson and Keith Strickland – toured Australia for a day on the green and indoor shows in 2009, the response was over-the-top! Irreverent and hugely entertaining, the band’s cosmic appeal was irresistible. The B-52’s put Athens, Georgia on the musical map with their quirky and unconventional take on the new wave sound of the era. Their irrepressible live shows and massive hits like ‘Rock Lobster’, ‘Private Idaho’, ‘Roam’ and the barnstorming ‘Love Shack’, which notched up eight weeks at #1 on the Australian charts, have endeared them to audiences worldwide.